TeamPage Winter 2019 Release focuses on performance. It incorporates major improvements in query optimization, handling of search expressions, and caching. These improvements will be particularly significant for customers with large journals and for those who use TeamPage solutions and reporting views that make extensive use of search expressions in queries and interactive tables. Other changes include: additions and improvements to the Impi! Quality Management ISO 9001:2015 TeamPage solution; new ability to show Google calendar events in TeamPage Calendar pages; new PDF, Excel, CSV, and print export of for Data Tables; new Data Table filtering per column; improvements to PDF generation; improved temporary file management; improved background process task management; and improved statistics gathering. The focus of this release is to improve the performance of TeamPage's built-in queries. These improvements will be particularly noticeable for customers with large journals, or for customers who use queries with many search terms. These optimizations apply to TeamPage's retrieval of the "base result set" for a query, before searches are applied. Modified the way that queries are serviced to ensure that requested parameters, such as date scoping, are are narrowed as much as possible before additional work is performed to retrieve any results. Moved all query type-specific "implicit" filtering to TeamPage's SDK query implementation layer, where in-memory metadata indices can be used to quickly disqualify candidate results that formerly had to be filtered out at higher levels of code. Optimized the handling of requested minimum and maximum numbers of results. Improved the handling of the handling of offsets used to retrieve the next "chunk" or "page" of results for infinite scrolling and in other similar contexts. These optimizations are related to TeamPage's handling of queries that have search expressions, and are designed to minimize the amount of work performed. Search expressions are now simplified before any additional work, such as performing auxiliary queries, is performed to apply them. Added short-circuiting to avoid performing any additional work when it can quickly be determined that there are not (or cannot be) any matching results for a search expression. Optimized the way in which search filtering is actually applied. The best filtering strategy is selected, which may be purely iterative predicate filtering, filtering using high performing auxiliary queries, or a hybrid approach, depending upon the size of the base result set and what sort of search expressions are present. Optimized the handling of auxiliary queries used to handle search expressions to ensure that the parameters, such as date scoping, are narrowed as much as possible while still matching the scoping of the base query and base result set. Whenever possible, queries that have searches will be rewritten to use an equivalent but better performing query based upon one or more of the search expressions. Quality, Risk, and Improvement capabilities of the TeamPage Quality Management solution have been substantially revised. They are now more tightly integrated with each other and extensible to handle related standards based activities. The Risk plug-in now supports use of a 'Standard' entry type. Standard entries can be created to represent various ISO standards — e.g. ISO 9001, ISO 45001, — that apply to different activities in an enterprise. A special CSV attachment to a Standard entry represents the available sets of choices for certain fields in other forms, including the Quality module's Nonconformity form. They can also designate a preferred template to be applied when a user chooses to create a new Nonconformity referencing that particular Standard. This capability makes it simpler to extend the TeamPage ISO 9001:2015 framework to handle other specific activities. The Quality solution's Nonconformity and Corrective Action entry types, and the forms used to create them, have been improved and expanded. Most changes depend upon the Risk capability, which via the new Standard entry and other changes, offers an expanded set of form fields, although the Quality module plug-in can still be used without the Risk plug-in. When the Risk plug-in is available, to create a new Nonconformity, the user must first choose an applicable Standard, and the choice of Standard governs the options that appear in certain other fields. Most of the due date fields for the separate phases covered by the Nonconformity and Corrective Action forms will now have default values when the user initially opens the forms, driven by per-space settings governing the offset in days from the current date to use for each default. This way, the default due dates can reflect the expected amount of time usually required to reach and complete each phase. Users now have the option to create an Innovation Task to follow up on an Improvement Opportunity. This provides a lighter-weight alternative than the full Improvement Project. Threats, Innovation Tasks and Improvement Opportunities can now all be associated with one or more feedback reports, and will appear in the special "References" list for any feedback report alongside Nonconformities and Corrective Actions. Buttons for adding any of these types of associated entries also appear there alongside the existing buttons to add new Nonconformities and Corrective Actions. Added server-level navigation tabs and pages for Nonconformities, to make it easy to survey quality management activities across all spaces. The TeamPage ISO 9001:2015 Quality Management Solution is packaged as a family of integrated Quality Management, Standard Meeting, and related plug-in extensions and templates, along with expert support to help your product or service organization work better, see ISO 9001:2015 Requirements Met By impi! Solutions. Please contact sales@tractionsoftware.com if you're interested in trying out this solution. We've made a number of improvements to the TeamPage Data Tables plug-in, which is free for licensed customers. You can use this integration to configure and add interactive tables to TeamPage entries based on entry types, properties, dates, status, relationships, and other data. If you're a developer, this plug-in also offers you a way to create interactive tables based on other TeamPage or external data sources you specify and control. This capability is useful in creating interactive dashboard, summary and other tables for general business solutions or your specific applications. You can learn more about the Data Tables plug-in here. TeamPage installers now automatically install the Data Tables plug-in. Use Ajax data loading to improve Data Tables performance. Users can now export CSV, Excel, PDF, and a print version with the click of a button. The exported data will reflect any active filters. Each column now has its own separate filter control. Administrators can now configure up to four Google Calendar sources to be made available for users to display in various Calendar pages. Each Calendar can be given its own display name, text color, and background color. Improve TeamPage metadata indices and journal entry cache design to improve memory footprint and improve performance. New framework for managing long-running background processes. New and improved statistics gathering for currently open resources. Allow administrators to enable or disable generation of TeamPage Digest views for Visitor accounts. Improve TeamPage type-ahead completion to always use Unified Search to provide more consistent results and improve performance. Improve performance of internal queries used to support password re-use policies. Improve performance of feed summary views. Updated SDK support Query API, File API, and handling of unexpected file load errors. Improve SDK support for management of Temporary files. Improved SDK entry filtering support. Improved Project Management and Status SDK entry type class definitions. New SDK Snippet tag for flexible generation and use of snippet text derived from entry text, external search engine content or other sources. Improved SDK search result Highlighter tag with simplified API. Security related improvements and bug fixes relating to: certain potential cross-site scripting and forgery attacks; certain potential open redirection attacks; password change requests; and web socket validation, see change log. The release includes many other bug fixes and improvements. See TeamPage Change Log for a detailed list of changes from this and subsequent point releases. Data Tables Plug-in About TeamPage integration the open-source DataTables JQuery plug-in. The Work Graph Model: TeamPage style Understand how TeamPage connects people and their work. A Fabric, not a Platform Making work actionable as well as observable: Objects, context, conversation, connection. The other day, I helped a Japanese IT Support company build a client support site with TeamPage. Their main request was to make the top page ("front page") of TeamPage simple as possible to be more welcoming and prevent clients from being confused. So, I (1) put the large icons and buttons on the top page and (2) removed tabs and sidebar etc. In this blog post, I will briefly introduce how I did the customizations using a TeamPage plug-in developed and delivered to the company. Let me introduce how TeamPage allow us to build a client support site with private and public spaces. A "space" is like a "room" in a TeamPage building. An administrator is like a janitor of the building. He or she creates private rooms for clients who purchase IT support services from the company. The TeamPage server also has spaces for internal staff, and public spaces to post information shared with all clients and internal staff. A client can not enter the private rooms for the other clients. Internal support staff including the administrators can enter all rooms. For example, the support requests, on-site remedy schedules, and the other articles and comments posted in the "Client A" room are allowed to be viewed by Client A only. They can not be seen by the other clients. On the other hand, the internal staff has a high level overview of everything. The company decided to start using TeamPage to build their support site because they had found Teampage as the best tool to manage the information security, track the latest situation for all clients, and research support records posted in the past by search. The top page before customization had the following interface. There were 3 green buttons, "Inquiry Form for PC", "Request via Phone", and "Request via Email". The buttons were embedded in an article and I put the article on the top page. The blue button "Go To Members' Page" was supposed to lead a client to his/her private space. The New Articles section showed the 5 newest article so that people could catch what was going on quickly on the top page. The Customer Information section showed the 5 newest articles with the "Customer Information" tag so that the internal staff can take a look quickly on the top page. Let the clients understand "Go to the membership page first" and do not allow them to do other operations on the top page. Add attractive graphics including a fancy character. The top page with text and buttons does not look inviting and may turn off the clients. TeamPage has lots of links and buttons on the page. This allows people to select their favorite ways to do an operation. One of them may do something by selecting a tab in the top navigation bar and another may do the same thing by clicking a link in the sidebar. It's designed to be flexible. However, my customer didn't like it. He said "If there are several ways to get the same goal, people may be confused to choose one. They need only one way. Remove the unnecessary links and buttons as possible from the top page so that there will be only one way to get to the members' page." I think this might be because of the difference of the educations in the U.S. and Japan. I've heard that the kids in the U.S. are taught to be independent, have their opinions, and make decisions. On the other hand, the kids in Japan are taught to follow the others to be a part of the teams first rather than express their opinions. Interesting, isn't it? Okay. Now let me introduce how I simplified the top page and made my customer happy. First of all, I had to hide unnecessary tabs and buttons as much as possible. Please see the animation shown below. I hid the black parts. The "home" icon for returning to the top page is unnecessary on the top page because you are supposed to be already on the top page. I hid it by using the following stylesheet (CSS). The "Setup" menu shows up only when a user logs in to TeamPage as an administrator. Since clients who post inquiries are not administrators, this menu will not be displayed. Therefore, customization is unnecessary. The "Invite" menu shows up only when a user logs in to TeamPage with a user account with the "Invite" permission. This permission is allowed to everyone by default, so I configured the permission is allowed only to the administrators. The tabs in the header bar is a frequently-used navigation In TeamPage. You can switch the tabs by your needs. For example, if you want to the tasks and/or projects of your team, you should select the "Tasks" tab. If you want to check the due dates of the tasks and/or your meeting schedules, you should select the "Calendar" tab. The tabs may be unnecessary for clients who are not familiar with TeamPage, but they are convenient and powerful navigation for those who are accustomed to TeamPage (such as administrators). So, I decided to set up "to hide the tabs for clients and display the tabs for administrators". The plugin-in that I recently created for this purpose is Set Special Class(es) to The HTML Body Tag plug-in which checks whether a logged-in user account belongs to a specific group and adds a special class(es) to the HTML <body> tag. I set it up to add class="is-admin" to the <body> tag if a logged-in user belongs to the administrator group. This allows me to display the tabs to the administrators only with the following stylesheet. Hide/Show Side Column plug-in, which is installed by default, has an option which allows users to select collapse (hide) or expand (show) the sidebar by default. All I had to do was selecting "hide by default" there. I disabled the sections in [Server Settings] > [Front page] configuration page. It was easy. The notification badge tells you the number of your notifications. You receive a notification when someone comments on your post, someone changed the status of your task, someone posts an event (a schedule) with you as an attendee, and so on. ... but I wanted the badge to be noticeable by making its color red. The default color is lightened color of the background bar. Don't you think it is inconspicuous? It was also easy to color the badge red. Just add the following CSS. I asked a web designer in the IT Support company to draw an image of the top page with a fancy character. Now, how do I put it on the top page of TeamPage? TeamPage has (1) the "Embed Content" plug-in which allows me to put any HTML code in an article and (2) the "Dashboard" capability which allows me to display a specific article(s) on the top page. With the combination of the (1) and (2), I thought I could achieve the goal. However, it turned out that there was a problem. Putting the green buttons and menus in the picture above is OK because the link target is fixed and the same for everyone but the destination of the "Members' Page" (the blue button) in the picture below must be different per client. The "Members' Page" means "the dashboard page in the client's private space". So the blue button must navigate a user from the client "ABC Company" to the "ABC" room ("ABC" private space) and a user from the client "XYZ Company" to the "XYZ" room etc. So I created a special small plug-in that checks the private space of a logged-in user and put the space name into the destination URL. Each client user is supposed to have the read permission in his/her private space and some public spaces. The plug-in gets the list of the spaces where the user has the read permission and exclude the public spaces from the list. <!--- Check each space in the list. The programming language for TeamPage customization is called "SDL" (Skin Develop Language). It looks like HTML and XML. You can modify the existing behaviors and create new features just like you create a web page. If you are interested in the SDL programming, why don't you come to our support site? It's free! Ta-da! Finally, the top page customizations are done. The IT Support company liked the simplified face of the top page. "It is quite simple and easy to understand! Customers will not get lost any more." On the standard front page of TeamPage, you can arrange sections such as "New Articles" and "New Tasks" like a newspaper, or you can put a specific article on it like a poster. In addition, you can change the landing page from the front page (the team-shared dashboard) to your own page. The TeamPage plug-in architecture makes it simple to install the customization, and allows the company to install new TeamPage updates without having to re-install the plug-in. One of the IT Support company said: "It was surprising and inspiring to me to know that TeamPage has such wonderful flexibilities and possibilities. I asked you many requests and you did never say "No, it is not supported." All our requests came to existence. Wonderful!" I was so glad to hear that! If you are interested in customizing TeamPage, please feel free to contact us. You can learn to do this customization yourself, ask us for TeamPage SDK training and support, or ask us to design, deliver and support a plug-in extension to match what you want to do. Working Across Boundaries ... There's no reason to settle for a collaboration and action tracking solution that only handles internal collaboration, or assumes that everything happens in a building with glass walls and no doors. Real business value and sustainable competitive advantage often depend on working easily within and across boundaries that need to be in place to do business. The Work Graph Model: TeamPage style ... A work graph consists of the units of work (tasks, ideas, clients, goals, agenda items); information about that work (relevant conversations, files, status, metadata); how it all fits together; and then the people involved with the work (who’s responsible for what? which people need to be kept in the loop?). お客様が迷わない！スッキリ簡潔なトップページのカスタマイズ例 Japanese language version of this blog post, on the Traction Software Japanese Business Office website. Follow @TSIJPBO on Twitter for TeamPage news from Japan! TeamPage 2018 Summer Release TeamPage's 9001:2015 Quality Management solution - developed in partnership with impi! Solutions - adds integrated Risk and Improvement Project management, tracking, and reporting capabilities. This release also adds: Advanced Japanese language search; improved type-ahead search; improved built-in search; many product and developer SDK bug fixes and improvements. Improved TeamPage ISO 9001:2015 support adds Risk and Improvement Project management to Non-Conformance and Corrective Action management, tracking, and reporting to deliver a broader, integrated ISO 9001:2015 Quality Management solution. Two TeamPage customers who tested the pre-release ISO 9001:2015 update previously used TeamPage to manage their quality documentation including Standard Operating Procedures, Work Instructions and Related content and were very happy with that - their auditors were very happy too. Both previously used Microsoft Word documents for Non-Conformance and Corrective Action Reports, and Excel spreadsheets and macros to track NC's and CA's. The ISO 9001:2015 specification includes new requirements for risk-based thinking as well as an improvement program. Risk and Improvement replace the concept of Preventive Action in the former ISO 9001:2008 specification. With the new requirement, customers have the opportunity and motivation to re-think their current practices. TeamPage relates NC and CA reports to SOPs and also relates Threats to SOPs. From there, Risks relate to Threats. The risks are scored and, as necessary, mitigated with innovations and improvements. Both pre-release customers liked the quality-specific article types and tight relationships included in the TeamPage ISO 9001:2015 solution; both upgraded to the new solution. They said that this will save time managing and reporting on the status of their NCs, CAs, Threats, Risks and mitigation activities. One customer described the improved TeamPage ISO 9001:2015 solution as "Perfectly fitting our needs". The ISO 9001:2015 Quality Management solution leverages TeamPage's unique Work Graph Model to integrate quality documentation, action tracking, reporting based on the business process improvement model created by impi. Solr based TeamPage Advanced Search is now available for use with Japanese language articles and files. The new Solr configuration includes Japanese language tokenization rules. Type-ahead completion and suggestions in TeamPage search and forms now uses Advanced Search when that capability has been installed and enabled. Queries using quotation marks to express phrase are now supported. Improved background memory cleanup and garbage collection performance. Improved private draft support and snippet generation for very large TeamPage articles, where each article may contain tens to hundreds of pages of content. Improved TeamPage behavior with external defined TeamPage accounts (e.g. a Microsoft Active Directory server) when an invalid account security principle encoding is encountered. Improved NTLMv2 logging and diagnosis of failed login attempts. Added statistics gathering for open file resources; improved statistics gathering for attachment save operations. Updated Apache Derby server version to 10.14.2.0. Improved performance of "Completed Tasks", "Total Tasks", and "% Tasks Complete" calculation for project and milestone reporting. Updated SDK support for handling fine-grain permission to erase specific versions or all versions of an entry. TeamPage's web forms SDK framework now supports an "html" pseudo-field type. This makes it easy to include possibly dynamic arbitrary markup in a form. Making it a field on the client side means that it can be set up to be dependent upon one or more other fields in the form, which means that the markup can be updated when a field change. SDK support for new event types for auto-refresh, entry-update, comment-insert, comment-update, comment-save and related events. The release also includes many other bug fixes and general improvements. See TeamPage Change Log for a detailed list of changes in this and intermediate point releases. Meeting ISO 9001:2015 requirements using TeamPage and the impi! model The organization steadily builds its very own Wikipedia, and it’s ISO 9001 compliant. The risk of deadwood documentation is reduced: team members create their own documentation, hyperlinking contextualizes the documentation and tagging and search capability ease retrieval of information. Why, How and What of the impi Standard Meeting Plug-in for TeamPage A short video demonstration and customer interview of the impi! Standard Meeting plug-in for TeamPage (part of the ISO 9001:2015 solution). Quality Management, Signature Requirements Introducing TeamPage Quality Management and Signature Requirement capabilities. TeamPage 2018 Spring Release includes a new Question and Answer plug-in that make it simple to add Q&A capabilities to any TeamPage solution. You can also introduce a dedicated Q&A space to support a forum connecting any combination of external customers, partners and internal team members. Caching performance improvements for large TeamPage journals. The release also includes over 60 bug fixes and general improvements. See TeamPage Change Log for a detailed list of changes in this and intermediate point releases. FullCalendar plug-in Configuring the and using new FullCalendar capabilities. TeamPage 6.2 is a major release which packages changes and improvements that have been incrementally delivered to cloud-hosted and on-premises customers. In addition to bug fixes and improvements, highlights of this release are updates to API's used by developers to extend TeamPage, and substantial internal refactoring to improve the structure of the TeamPage code base. New features and capabilities based on impi! Solutions partnership include a new a Threat and Opportunity module. The Threat and Opportunity module helps businesses identify, document, and handle risks posed by threats to business processes. A risk can be linked to innovation tasks to mitigate that risk, or to an improvement opportunity that is tracked and managed as part of an improvement project. Improved handling of auto-logged replies to TeamPage email notifications. Configurable project tracking tables can show the number of complete tasks or percent completed. Improved document relevance boost can use the number of incoming or outgoing cross-references, tags, the size of the entries discussion thread, number of updates, entry type, and other metrics to score relevance and return relevant results for any query. Improved Table of Contents widget (customer contributed) is now part of the TeamPage supported baseline. Improved interactive tooltip shows the title of the project or milestone associated with a Calendar event. Updated Public SDK API includes: new built-in sorting capabilities; improved flattened thread and sub-thread queries; configurable dynamic updates to form fields; form support for multi-level dialogs; support for required fields; regular expression support for list type matcher; support for numeric field types; relevance boost can now show an explanation of scoring to help understand why a result appears where it does in a list of search results. TeamPage SDK extensions and improvements support new TeamPage plug-ins and plug-in solutions developed by Traction Software, Traction Software's Japanese Business Office, partners, and customers. Many specific bug fixes and performance improvements, see TeamPage 6.2 Change Log for details.See TeamPage Change Log for a detailed list of changes in this and intermediate point releases. TeamPage Real-Time Daily Report 日報 (Japan can include tasks, scheduled events, meeting notes, photos, and Customer contact notes using an extensible CRM form on desktop or mobile devices. Team members, as well as bosses, can share notes, plans, and a Daily Report calendar of events. See @TSIJPO for Traction Software Japan's Twitter feed. The new impi! Standard Meeting Plug-in for TeamPage enables easier, faster and more accurate minute taking for recurring meetings which agenda is standardized. It augments the impi! solution: Goal Alignment - Mini Business Units Deployment. To learn more about this plug-in and impi's Business Management System solutions built using TeamPage, please contact Traction Software. In a Lean enterprise, the unit of continuous improvement is the task or action. It needs to be explicit and time bound. Members make themselves accountable by first agreeing on the tasks and then taking responsibility to carry them out. The best forum to review progress is the mini-business unit (MBU) meeting where accountability is achieved with transparency and simplicity. This is one of the reason why visual management is much prevalent in Companies seeking excellent processes and people. At operational level, a wall is well suited to communicate priority tasks and decisions. Together with Key Performance indicators and other succinct and essential information, the priority tasks are recorded on a board. The traditional supervisor black book is now replaced with an information medium available to all. The interval between two meetings is short (from a shift to a week) and the priority tasks are straight forward. The meeting is recurring and its agenda is standardized: there isn't a need for minute taking. However, for MBUs where the nature of the standard meetings is more systemic or strategic, tasks become more complex and numerous. Decisions need to be recorded too. Even general information and detailed minutes can be needed. This is typical with cross-functional operational meetings, management reviews, monthly executive or sales meetings, multisite meetings where new information and intelligence are shared. An electronic solution is required. Here, the wall, board and pens are replaced with the screen, projector and computer; this is still visual management. The Standard Meeting Plug-in leverages the capability of TeamPage for task management and contextualizing information. Our development drive has been to offer a solution that would be intuitive, easy to use and offering simple and deep ways of finding historical tasks, decisions, and minutes. Additionally the ability to see at one glance all historical decisions associated to a particular meeting profile, provides a coach insight into the chairperson management style. The administrative information that identifies the standard meeting e.g. meeting name, location, attendees, etc. Open and closed tasks from the current meeting and open tasks from past meetings. The resulting solution allows the team to capture on the go tasks and decisions associated to the meeting profile. Past open tasks are always on the radar screen, thus reinforcing accountability. Information retrieval is immediate in the context of the meeting. The plug-in is a productivity tool and a time saver. Example of usage of the standard meeting plugin would be for management and senior management meetings, project reviews, management reviews, compliance/governance meetings, multisite meetings, etc. A standard meeting is defined by its 4Ps. impi! users define the detailed meeting profiles in their Knowledge Central space alternatively the 4Ps will be defined in the meeting profile article created in the relevant space. A standard meetings section is configured In MBU spaces (e.g. BU3 operational) or special purpose spaces (e.g. Environmental Management). We can navigate from to the previous and next meeting directly from the current minutes. Also, a new meeting minutes can be created In the Meeting profile itself or alternatively from the latest meeting minutes. Traction Software's Japanese Business office launched a dedicated DailyReports.biz site and solution for the Japanese Daily Report 日報 practice. In some Japanese companies, at the end of each day employees are expected to write a summary of what they did and submit it to their boss. This is called a "日報" (daily report or daily journal) and is traditionally used to share information between employees and bosses. Rather than adding a chore at the end of each day, the new Daily Report solution makes it easy to share a short note after a talk with a customer, when a task is completed, or after some other noteworthy event. The note is easy to post using a phone, tablet, or desktop computer and is shared in with others in real time. The note is also automatically included in a summary email digest at the end of the day, see DailyReports.biz (Japanese). Traction Software doesn't currently market a dedicated Daily Report solution in other countries. For US and other markets, please contact US sales if you're interested in using the Daily Reports solution. Daily Report 日報 = Observable Work: Takashi Okutsu - About the Daily Report practice in Japan. Eat your spinach: Email is good for you, but it could taste a lot better - ホウレンソウ (HORENSO) has a literal English translation "spinach", but it is used to refer to a Japanese practice that aligns members understanding and synchronizes actions. impi! What's in the name? What's in the logo? Impi is a Zulu word for any armed body of men. It also bears in English a connotation to the art of warfare. In the early part of the 19th century the Zulu nation, then a relatively small tribe rose to a prominent nation. Under the leadership of King Shaka its influence span across Southern Africa. Shaka deeply transformed the art of warfare in the sub continent drawing from traditions and innovating. Aspects of warfare covered army structure and deployment, leadership, training, agility, logistic, weaponry, etc. Shaka's organisational development and leading of his impis were characterised by discipline (standardisation) and creative improvement. Shaka's influence in improving the impi was sustained to the point that 71 years after his death, at the battle of Isandlwana in 1879, the numerically superior Zulu impi defeated the British despite a vast disadvantage in weapons technology. "The British Army had suffered its worst defeat against an indigenous technologically vastly inferior foe." (See Wikipedia article). impi! as a set of solutions offers a disciplined and structured approach to establishing the Business Management Systems (ISO 9001 compliant) of organisations based on continuous improvement. It relies on the transformation of individuals that become a thinking people by improving processes through discipline and creativity. So if an organisation and its employees constitute an impi, who would be the enemy? The various risks associated to operating a business and the wasteful activities embedded in the processes are the enemy. And it goes on: the age-grade regiments are the MBUs; the Bull-Horn formation is part of the management systems; the shields are the standards used to protect; the spears are the methods used to improve (problem solving, innovation, improvement projects) i.e. atrophy the risks and eradicate problems. Social Structure and Technical Structure of an organisation as per Paul Adler (1999). A stunning observation of the evolution of the impi under King Shaka is the level of innovation and creativity stemming from the cultural traditions and the simultaneous increase in discipline. In the Lean manufacturing approach, leadership intentionally develops a thinking people on the foundation of strong structures and standards. A common view of organisational structures is to look at discipline and creativity as the two ends of the same structural continuum. Jeffrey Liker in a footnote of the Toyota Way (2004) makes reference to Paul Adler's paper on Building Better Bureaucracies (1999). Adler's model shows that creativity (enabling Social Structure) and discipline (strong Technical Structure) are two favourable features of an empowered organisation. The Intern (2015 film) makes an interesting point in the balance between discipline and creativity (although the critics would have missed in the movie the case for enabling bureaucracies). Long before we started building the blocks (the solutions) for impi! in 2012, we wanted to lay a foundation: a dynamic model that would help understand how a customer driven company operates. Business Management Systems are constructs designed to manage knowledge. In the words of Peter Drucker, "the essence of management is to make knowledge productive". The Core Cycle is an integrated model that attempts to make the statement actionable. It consists of five interrelated factors namely: contribution, best operating practice (BOP), best improvement practice (BIP), leadership and structure, and empowerment. Back in 2005, the author became a champion for the implementation of a continuous improvement programme. He created the ancestor of the Core Cycle as a theme to communicate the change about to happen in the organisation. It consisted in a shield representing the discipline in the organisation and a spear representing innovation or improvement. With the shield, one can defend. In the case of the organisation, this means defending a business model, people, environment, shareholder value. But an organisation that only defends systems defined in the past cannot sustain without improvement: attacking to craft a future for the organisation by continuously improving. Improvement and Discipline have been identified as success factors of the impi. Defending with the shield; attacking with the spear. The evolution from this picture to the Core Cycle happened over the years. The shield became the Best Operating practice (BOP) and the spear became the Business Improvement Practice (BIP). We care relates to the protection offered by the shield. We care for others, the business model, the systems and processes, shareholder value, etc. We Continuously Improve relates to the spear and carving a future for impi!, our partners and clients. We Contribute by defeating the enemy: risk and waste (value addition). The impi! logo below represents the i of impi! and the exclamation mark; continuously spinning, like Deming's wheel, the PDCA cycle. We standardise, improve and sustain, like King Shaka did with the impi. And by the way, why an "!" at the end of impi! ? Because the impi is powerful, compelling and exciting. Listen to Johnny Clegg, relating the battle of Isandlwana in his song impi! Introducing impi! - Pierre Bienvenüe - Concepts impi! uses to build business management systems. Convergence of Quality Assurance and Continuous Improvement. ISO 9001:2015 Requirements Met By impi! Solutions - ISO 9001:2015 requirements based on lessons learned working with one of my clients since July 2015 under the guidance of one of the contributors to the new version of the standard. Apple and Google are competing to build a fabric that connects everything you own and use, working outward from the globally meshed supercomputer you carry in your pocket. Both apply deep learning technology to AI assistants, and are opening up their AIs and bots to other apps, bots, and cloud services. This richly connected fabric makes bots useful and AI assistants valuable by teaching them how to identify objects you're talking about as well as understand what you want done. The same applies at work. Making this happen requires a shift from the traditional definition of a platform to a fabric which makes it possible to connect people and the actionable objects they use, in context. First of all, work is not all done in one place. The things that people talk about and use to get work done are scattered across a handful of silos and apps. For some people it's a scary, dark forest of silos and apps, but most people rely on a handful of places to get their daily work done - and are reluctant to venture outside the places they know. Nothing is ever done in one place; work is intrinsically intertwingled. People will use their own smart phones and apps to route around omissions and ugly bumps that IT provides. Trying to stuff all work into one big box is much, much worse: I remember the global bank whose Lotus Notes repositories spent almost all of their cycles synchronizing with each other. In a competitive marketplace, progress is made in fits and starts. New apps, platforms and services are far better, cheaper and more fun to use than apps fossilized by IT for a small captive, internal audience, written and maintained by the lowest-cost outsourced bidder. It's an opportunity for companies like Salesforce and others to build big service platforms to create cozy places for familiar activities, lowering friction and adding guardrails for guidance. Sharing platforms like Box, Dropbox, and Google also aspire to become platforms for work, trying to convince customers and developers to choose their platform to build cozy places for specific activities. How can we make work actionable? I hope you all agree that one way to make life easier for people trying to get work done together is to make their work observable. I believe it's also valuable to make work actionable - by individuals, teams, apps, bots, and AIs. Think "actionable" in the sense of actionable intelligence: "information that can be acted upon, with the further implication that actions should be taken." Think "work" in the sense of "work product" like tasks, documents, CAD files, transactions in system of record, as well as the trail of actions taken and resources used by people, apps, or bots to get work done. In an ideal world, the information you want, things you need to work with, and people who you should talk with should be just a click - or a "Hey Siri" - away. I'll call this actionable work since it expresses a desire to make what you or others have done, used or talked about in the past usable to get work done in the future. Effortlessly findable. Easily usable. It should fall readily to hand. How close can we come to the ideal? What's needed? What stands in the way? Objects - Documents, pages, messages, tasks, discussions, and transactions need to be findable, addressable, and usable as objects of action verbs, whether than verb is an action taken using a click, API call, message to a bot, or request to an assistant like Siri. Context - To make work actionable, you need to implicitly or explicitly identify the context of an action's reference; context itself becomes an object of actionable work. Although this sounds like something that only a programmer would say, think about how you reference objects in a conversation: "How are we doing on the Acme Products proposal?" A human being you work with either has a pretty good idea of what you mean in some shared context, or will ask you a question to clarify. A good reply might be "We're waiting for Chris. He should approve it or get back with questions by Wednesday close of business". Could a bot do this? Even if you're not using a bot, could a request like "How're we doing on the Acme Products proposal?" give you a link to the relevant status and related activity rather than just a link to a document named Acme Proposal? Software objects have addresses or names that can identify that object in the context of some open domain like the web or a closed domain like a database. Although some objects of actionable work have human sensible names, few of these names are unique. Unique names are themselves unique in a context like names in your address book, names in corporate directory, or assigned names like invoice numbers and permalinks in a system of record. Many objects of actionable work don't have human sensible names, but become addressable when a click on a screen or command like "reply" enables a software system to identify the object you want to act on. Work Graph - Whether shown on a screen or mentioned in a relevant context, context makes objects of actionable work findable, usable, and fall readily to hand. By "fall readily to hand" I mean easily accessible to human beings who talk about related objects of work. People, bots, and AIs need to understand what humans means when they say "Send this to Jordan and see if he agrees", or "Open a trouble report on this." Building on a term coined by Justin Rosenstein, l call this representation of related people, objects and trails of actions in context a work graph. Work like the web - You don't need to get into arguments about the world of apps versus the work of the web so long as the underlying objects you use are addressable and usable with standard W3C protocols. It doesn't matter if you use Facebook's mobile app or Facebook's web browser interface so long as both user interfaces show and use the same objects and content under the covers on the server side. You also want to: 1) identify yourself once, and use that identity consistently; 2) rely on web services to consistently grant or deny access and other permissions based on that identity; 3) rely on web services for actions, permission-aware search and navigation throughout an interoperable fabric. Traditionally, "platform" refers to a software product with APIs used to construct or extend applications and services, like the original version of Lotus Notes. With the advent of the web, service business like Salesforce, SAP, and others began opening up their cloud platforms to entice builders to add complementary capabilities that "work like Salesforce" etc. Sharing services like Box and Dropbox began opening up their platforms to enable apps as well as people to share documents and handle closely related activities. Likewise Slack is building out its messaging platform, adding bot and message button extensions to use external services from within Slack, and connectors to enable sharing and other services to use Slack for messaging. Platform wars - The fact that all of these services are available via the cloud makes a basic level of W3C-based interoperability possible, if not exactly easy or pleasant. It's plate juggling time, even for organizations that try to stuff all of their work into the same box. Customers, partners, and employees find it's even easier to use their phones and favorite services to route around what's missing or awkward to use at work. The good news: market pressures are driving platform builders to compete on their ability to connect and interoperate with complementary or competing services. At the same time, the shift to mobile first drives adoption of bot and AI conversational interfaces since: 1) there's no room to show a long list of results or screens that look like an old fashion airplane cockpit on a mobile screen; 2) people aren't willing to put up with the clutter; 3) people feel comfortable with a conversational interface that reliably understands what they want done and asks for clarification or confirmation when appropriate. A great conversational interface requires a good way to model context, whether the conversation is driven by text messages, voice, or a sequence of screens. I believe what's needed is a fabric for actionable work that lives over traditional cloud platforms and services. Not one big box where all the work gets done, but a thin layer of pages, messages, and trails of activity using identity and a work graph to enable people, bots, and AIs to understand what people want to do, how to find the right objects, and how to do it. Transactional and other work done inside a system of record or a selected service platform will still be done using that platform, linked from the actionable objects in the work graph using standard W3C links or vendor API services. TeamPage permissions make it easy to define who can see and use actionable objects, expressed in the context of a business activity like Quality Management. Customers, partners and employees build a shared fabric of actionable work, relying on TeamPage to clip references to related work that's more private than they're permitted to see. The work graph and its actionable objects are the right resources for bots and AI's to learn how to make what you care about effortlessly findable, easily usable, and accessible to bots and AI's you trust. Hey Siri - how're we doing on the Acme Products proposal? Reinventing the Web II (2014) Why isn't the Web a reliable and useful long term store for the links and content people independently create? What can we do to fix that? Who benefits from creating spaces with stable, permanently addressable content? Who pays? What incentives can make Web scale permanent, stable content with reliable bidirectional links and other goodies as common and useful as Web search over the entire flakey, decentralized and wildly successful Web? Includes links to the 2016 Internet Archive Decentralized Web Summit and other resources. Continuity and Intertwingled Work (2014) A level above an Internet of Things: Apple aims to deliver a seamless fabric spanning what's in your phone, tablet, car, and home, for you, your family, and trusted services at work. Google::Apple is the new Microsoft::Apple (2016) A two player race between the most valuable and capable enterprises on earth. "It could be ML/AI/NLP/Cloud is new OEM licensing Achilles heel, as one example? Conversely, did Android inherit ecosystem fracturing? @stevesi" "IMO only Google and Apple have a sufficiently well-connected fabric of personal information, mobile platform, apps. @roundtrip'' An annotated Twitter conversation with links to Google and Apple fabric references. Contextual Computing At Work (2013) Peter Morrison argues that the future or work isn't mobile, it's contextual: "Always-present computers, able to sense the objective and subjective aspects of a given situation, will augment our ability to perceive and act in the moment based on where we are, who we’re with, and our past experiences. These are our sixth, seventh, and eighth senses." Intertwingled Work (2010) No one Web service or collection of Web servers contain everything people need, but we get along using search and creative services that link content across wildly different sources. The same principle applies when you want to link and work across widely diverse siloed systems of record and transactional databases. Enterprise 2.0 and Observable Work (2010) Jim McGee wrote: "One unintended consequence of today's technology environment is to make the process of knowledge work less visible just when we need it to be more so. The end products of knowledge work are already highly refined abstractions; a financial analysis, project plan, consulting report, or article. Today, the evolution from germ of an idea through intermediate representations and false starts to finished product exists, if at all, as a series of morphing digital representations and ephemeral feedback interactions." We need to make work observable. Impi! founder Pierre Bienvenüe shares his analysis of ISO 9001:2015 requirements based on lessons learned working with one of his clients since July 2015 under the guidance of one of the contributors to the new version of the standard. He uses the impi! model to document mappings from sub-clauses of the impi! solution model to ISO 9001:2015 requirements, and from ISO clauses and sub-clauses to solution capabilities. Pierre writes: "Since July 2015, I've had the privilege to contribute to the ISO 9001:2015 implementation at one of my clients (my official guinea pig!) under the guidance of one of the contributors to the new version of the standard. impi! has proven itself to be a solid and flexible platform to work through the implementation and manage the required documentation. As a result, the current impi! solutions are supportive of the new standard." "All impi! solutions are built on TeamPage on a wiki space and are standard documents. Every solution starts with a Policy (the why) and a Standard Operating Procedure (the how). The SOP is the hub that links all the other documents (the spokes). The templates used for these documents are the same that the client can use for their own controlled documentation in their own wiki space called “Knowledge Central”. Two outputs of every improvement projects are a) an operational improvement and b) documentation in Knowledge Central. The project templates used to run improvement projects comprise standard articles that will naturally become elements of the BOP (e.g. SIPOC, business process maps). When the project leader reaches the Control or Adjust part of the project, large chunks of the documentation would have been written. Using the capability of TeamPage simplifies the linking and tagging of documents. The organisation steadily builds its very own Wikipedia, and it’s ISO 9001 compliant. The risk of deadwood documentation is reduced: team members create their own documentation, hyperlinking contextualises the documentation and tagging and search capability ease retrieval of information." "Of course we apply this model to definition and development of our own impi! solutions! I'm happy to share my mapping of imp! Solution clauses to ISO 9001:2015 requirements - and the inverse mapping from ISO 9001:2015 to imp! solution clauses. This is a living document that guides definition and development of TeamPage solutions developed by impi! and Traction Software." Pierre Bienvenüe is founder of impi Business Improvement Solutions Pty, a South African business improvement firm and TeamPage solution partner since 2012. See Introducing impi! for contact information and background. See Quality Management, Signature Requirements for more about Traction Software's Quality Management option. Please contact us for Quality Option details. establishing clear policy direction and responsibilities. Changes to processes are managed through IPs. Responsibilities and Resources are identified during the project and deployed. Knowledge Central is a moderated space configured to organise and retrieve internal and external knowledge. The change management and communication is planned to ensure the organisation's employees are communicated the structural and strategic changes, the Vision, Mission, Value Statement, breakthrough and annual objectives. Standard meetings are regular forums where non-conformance and improvement are managed in the relevant MBUs. The change management and communication is planned to ensure the organisation's employees are communicated the structural and strategic changes, the vision, mission, values, breakthrough and annual objectives. Operational, systemic and strategic improvement projects are managed through the IP system. Leadership establishes and manages the process of long range planning. The change management and communication is planned to ensure the organisation's employees are communicated the structural and strategic changes, the vision, Mission mission, values, breakthrough and annual objectives. I'm happy to introduce Pierre Bienvenüe, founder of impi Business Improvement Solutions Pty, a South African business improvement firm and TeamPage solution partner since 2012. Pierre has great experience in helping mid-size companies organize and run effective quality improvement programmes. impi! works with clients as partners from concept definition, initial rollout, through improvement of the quality program itself. Pierre has worked with Traction Software and clients to develop templates, plug-in extensions, and a methodology for using TeamPage to support the impi! business improvement model, with solid results to report. This post is an introduction. You'll hear more from Pierre as an expert guest blogger on this page, in Traction Software's TeamPage customer forums (free registration), and across the web. Additionally, for a few years now we have experienced the convergence of Quality Assurance and Continuous Improvement. The latter becoming the enabler of the former. Since July 2015, I've had the privilege to contribute to the ISO 9001:2015 implementation at one of my clients (my official guinea pig!) under the guidance of one of the contributors to the new version of the standard. impi! has proven itself to be a solid and flexible platform to work through the implementation and manage the required documentation. As a result, the current impi! solutions are supportive of the new standard. Why choosing mid-size companies? Their systems are usually less mature than that of large corporations and therefore, the implementation of an IT system underpinning the BMS wouldn’t usually clash with legacy systems. Also, most importantly, top management in mid-size organisations are more likely to get their hands dirty coaching the teams (changing the nappies) rather than the consultant-nanny who too often ends up raising the kids by implementing the programme bottom-up (which always fails in my experience). 1. Integration of document management and improvement, blurring the lines between creativity and discipline, short term operation and long term systemic improvement. The question here is how to ensure that improvement results in standardisation and standardisation in sustainability. There is always a tension between moving fast in improving and taking time to properly document, train and even audit. Another tension exists between the daily operation (immediate) and its systemic improvement (essential). Here, a footnote on the Toyota Way led me to Paul Adler's article: “Building better bureaucracies” (see also attachment) on enabling vs coercive structures. And gave me hope that discipline and creativity should coexist in the workplace. A technology (social media for companies: TeamPage) as an enabler of the Core Cycle that provides an integrated work environment, flexibility, ease of use and at the same time provides structure and visibility. With the technology we can have knowledge workers and even supervisors to collaborate, share, task, project manage, create and manage documents, etc. I experimented and now understand that the technology - social media for companies (Enterprise 2.0) - and the philosophy - the Toyota half-way (see attachment) - share many principles: collaboration, transparency, accountability, emergence (pattern of improvement: pushing the knowledge threshold by doing). 2. Management needs to become a routine, implementing a routine is a project, starts at the top, everyone is responsible for improving the organisation. entrench the routine of change before planning to roll out at operational level. Rather than starting an improvement programme - typically with business goal alignment, we first need to build the structure for improvement. I found that a two-weekly cycle of project review sets up a pace for the company and puts the right pressure on both top management and project leaders. I borrowed that idea from a 6-sigma project management method. Everyone with a computer runs an improvement project (initially) related to their processes. The project leader gets some face time weekly (20 to 60 minutes) with a sponsor (the process owner = top management). Every two weeks, project leaders stand up and give an account of progress before top management using TeamPage. This is show time. Coaching and learning naturally happens. Con artists are exposed. We get to eat together. We celebrate project closure. The improvement champion (internal or external) can use that time for short training time at the point of need (e.g. what the hell is the Toyota Kata? What is a Pareto analysis, how and when to use it?). The forum is also used to get the teams to contribute to the Long Range Planning process. Then implementation of any system is pushed through that improvement process. It is logged and managed as a project e.g. establishing standard meetings, rolling out KPIs, ISO 9001 implementation, 5S and of course improvement of business and operational processes. So we guarantee alignment to strategic objectives and make the workload of project leaders obvious. We create spaces for the systemic, strategic and selected operational mini-business units. The more the team uses the platform for its daily operation for communicating and tasking, the easier it becomes to use it for project management and documenting: it is the same platform. A bonus feature is that email traffic diminishes. Visual management (e.g. KPI tracking) is still displayed on the walls, yet in some cases is duplicated electronically. Tasking and minute taking is captured live by the team members in the relevant MBUs. Knowledge can also be created in the context of daily activities with threaded discussions. The discussions are usually informal but they are searchable and can be tasked. All impi! solutions are built on TeamPage on a wiki space and are standard documents. Every solution starts with a Policy (the why) and a Standard Operating Procedure (the how). The SOP is the hub that links all the other documents (the spokes). The templates used for these documents are the same that the client can use for their own controlled documentation in their own wiki space called “Knowledge Central”. Two outputs of every improvement projects are a) an operational improvement and b) documentation in Knowledge Central. The project templates used to run improvement projects comprise standard articles that will naturally become elements of the BOP (e.g. SIPOC, business process maps). When the project leader reaches the Control or Adjust part of the project, large chunks of the documentation would have been written. Using the capability of TeamPage simplifies the linking and tagging of documents. The organisation steadily builds its very own Wikipedia, and it’s ISO 9001 compliant. The risk of deadwood documentation is reduced: team members create their own documentation, hyperlinking contextualises the documentation and tagging and search capability ease retrieval of information. Several templates are available for improvement projects (e.g. PDCA, DMAIC). With each project milestones are associated standard articles e.g. project charter, project checklist, Fishbone diagram, business process “AS IS". To each milestone there are also associated tasks. In each task is a tutorial on its own with tips and links to glossary terms, One Point Lessons (e.g. How to use a risk assessment matrix) or external reference in the public domain, e.g. Wikipedia, Lean Institute. Finally, here is a one page summary of impi! and the synopsis of one of the three solutions that Traction and I have released thus far and are currently being used at clients. Voilà - I hope there is enough meat here to stimulate a conversation or two. Since I have only developed impi! thus far with my clients and for my clients, I haven't started a public website. It will be up this year. Immediately though, I will value the comments and interactions @Pierre on Traction Software's TeamPage server (free registration) or email pierre@impi.solutions. In the meantime, gazing a last time at the horizon of this South African part of the Indian Ocean, I'm aiming down to the engine room, pondering how I am to navigate this blue ocean. Watch this video of Chris Nuzum's Tripping Up Memory Lane talk at Hyperkult 2015, University of Lüneburg, 10 July 2015. Traction Software CTO and co-founder Chris Nuzum reviews hypertext history, his experience as a hypertext practitioner, and the core principles of Traction TeamPage. Adobe Flash required for desktop Chrome or Internet Explorer 10 and earlier. Tripping Up Memory Lane - Chris Nuzum's written notes for his Hyperkult XXV talk. Original Traction Product Proposal - Hypertext roots and evolution of Traction TeamPage. Doug Engelbart | 85th Birthday Jan 30, 2010 - "Doug Engelbart sat under a twenty-two-foot-high video screen, "dealing lightning with both hands." At least that's the way it seemed to Chuck Thacker, a young Xerox PARC computer designer who was later shown a video of the demonstration that changed the course of the computer world." Thought Vectors - Ted Nelson: Art not Technology - "To give up on human understanding is to give up hope, what we call in English 'a counsel of despair.' I think there is hope for much better and more powerful software designs that will give ordinary people the power over computers that they have always wanted - power with complete understanding. But that requires inspired software design, which I believe is art and not technology." I was delighted to find that our TeamPage iOS companion app was published on the App Store this morning. We've been enjoying the app for the past few months, and are excited finally to be able to share it with you. We've often thought about what we wanted in a mobile TeamPage app. Our ambition set a pretty high bar. The app that we released today is not the app we thought we needed to build. It's the app that we were tired of living without. It has a simple objective: make it easy to stay in the loop when you're living your life away from your desk. So you can dash off a quick response while waiting in line for a coffee; read and respond to last night's posts on the train; or add an incoming request to your worklist before you turn off the light. TeamPage provides dozens of ways to slice and present information: feeds and dashboards scoped to spaces, projects, and milestones; task lists; section tables; tag change and history views, cross-references and audit trails. We boiled the mobile app down to two views: Notifications and Discussions. Low volume, focused on what you care about and what you need to know. Great for responding to @mentions, seeing tasks assigned to you, following discussions you've participated in, and tracking activity on projects you own, spaces you subscribe to, and people you follow. Perfect for individual contributors, engineers, and people who prefer to work with headphones on, since it keeps the level of distraction to a minimum. For when you want to, or need to, scan everything that's going on. Perfect for analysts, support staff, and managers who need to scan for activity of interest and either jump into the conversation or follow up in detail later. Personally, if it's been a while since I checked in, I review my notifications first, and then scan through discussions. The list view showing notifications and discussions uses a new unread tracking capability built into TeamPage and synchronized with the iOS application to give you a snippet of the next unread message in the thread, while showing you the avatar of the person who posted it. The discussions and notifications views are ordered based on how recently the thread was active, so you only need to scan down the list until you've reached an item you've seen before to know that you're all caught up. The yellow highlight on unread items also helps with this, making it very easy to stay on top of what's new. The Desktop version of TeamPage uses nesting to visualize replies in context, which works very well for getting the big picture and for threads you haven't read. In the app, to facilitate catching up on the latest additions, we organize the replies chronologically, and use the unread tracking to scroll you down to the next unread reply. We also make it easy to swipe left and right or use left and right arrows to go to the next or previous thread in the list, which makes it very easy to catch up on activity using only one hand. When it comes down to it, when something comes to your attention on your mobile device, you either can deal with it then and there, or you can't. If you just need to answer a question, you can use the Reply via Email action to type or dictate a quick reply. If you need to come back to it later, you can add it to your Worklist, where it will show up on top when you get back to your desk. And if you need access to the full TeamPage web interface, e.g. to assign a task to someone, you can open a browser to the current discussion by switching from the preview tab to the WWW tab. 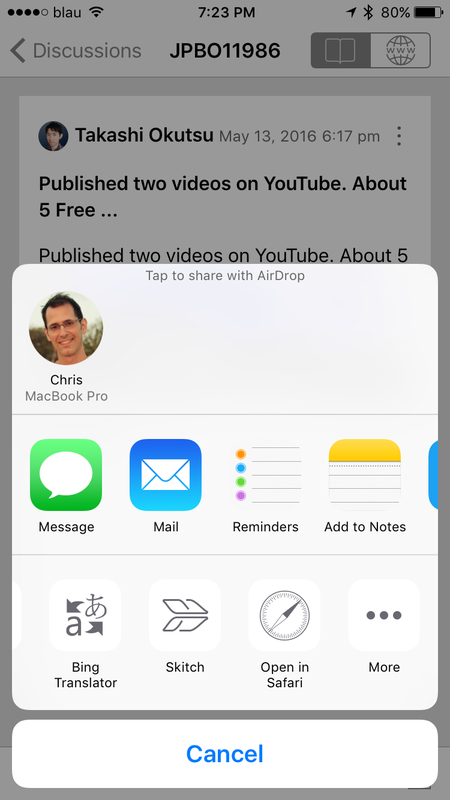 Finally, you can use the Share Sheet to share a post's URL with other iOS apps. For starters, anyway. We've focused on making it fast, functional, and friendly, while laying a foundation for future features. Behind the scenes, there's a new REST API on the server side; you can learn more about that in my next post, Behind the Scenes of the iOS TeamPage App. We'll be extending that API in concert with new features for iOS and other clients. We welcome your feedback, ideas, and, inevitably, bug reports. We know our 1.0 isn't perfect, and it certainly isn't complete, but we find it indispensable, and hope you will too. Depending on how you use TeamPage, you'll probably have a different opinion about what should come next. If you use it for ISO 9000 compliance or Quality Management, you might want to be able to compose new Quality Issues with photos right from the phone (today you can email them in). If you're a Competitive Intelligence professional, you might want access to Advanced Search. If you're a project manager, you might want to edit your project's tasks, or your team members' worklists. Please send questions and feedback to ios@tractionsoftware.com, or post in the TeamPage Forum. Note: The TeamPage app requires a TeamPage server version 6.1.14 or later. If you're a hosted customer, you're ready to go. If you have an on-premise TeamPage server, you'll need to upgrade before you enjoy the iOS app with your TeamPage server. If you're interested in how we built the app, stay tuned for my next post, Behind the Scenes of the iOS TeamPage App. TeamPage Spring 2016 Release introduces: the first release of a new TeamPage Mobile App for iPhone and iPad; a new TeamPage Document Management user interface; the first release of a new JSON API for mobile devices, bots, and other external clients; improved external search engine integration; bug fixes, improvements, and other changes. The free TeamPage app lets you review TeamPage discussions and notifications, tracks what you have read, and lets you add items to your worklist and reply via email. It also supports offline reading and replying to downloaded content. It's a handy way to keep up with activity in TeamPage using your iPhone or iPad when you're away from your desk. See TeamPage iOS Application and Chris Nuzum's blog post for details and examples. You can download the free TeamPage App from Apple's iOS App Store. TeamPage's document management interface has been revamped, and now supports a native move feature for moving files and folders. • The section table widget now supports sections driven by external search engine queies. • The reset password view, which is used with the "Forgot your password?" feature that can be enabled on TeamPage's login form, now displays password requirements you've set, such as minimum length or minimum numbers of special characters. Previously, these requirements were shown in other contexts where TeamPage user account passwords are being chosen, but not on this page. • Improved dashboard section RSS and Atom feed support. • Documents page's network drive link is now easier to spot, and the accompanying help tip has been improved. • Improved reporting and recovery from network errors such as intermittent internet connectivity problems. • Upgraded the version of Java packaged with TeamPage to Oracle JRE 8u72. • Improved support for the Microsoft Edge web browser. • Fixed a bug that could prevent localizations of TeamPage's rich text editor for certain languages (including French) from being correctly loaded. • Added support for Calibri font to the Proteus skin, as well as to the Print skin, and PDF export options. • Fixed an issue that could prevent email notifications from being sent in certain situations when a user changed their locale. • In order to support external clients, such as mobile devices and chat bots, the first part of a new com.traction.jsonapi plug-in is now included in TeamPage. Takashi Okutsu of Traction Software's Japanese Business Office recently posted an update to his Daily Report TeamPage plugin. Takashi writes: "In some Japanese companies, it is common to look back what an employee did in the day, write a summary, and submit it to his/her boss. This is called "日報" (daily report or daily journal) and it's a way of sharing information between employees and bosses in the hierarchy. If you are interested in the ways of business in Japanese companies, you may find this blog post interesting." This example of Observable Work is very simple to understand and use. Quality Management and other TeamPage solutions follow the same pattern. Update 18 July 2016: See DailyReports.biz for information about Traction Software Japan's new dedicated Daily Report solution, including a live demonstration, pricing, feature summary and frequently asked questions. Takashi's plug-in adds a Daily Report form to post and edit daily reports, along with a Daily Reports tab that includes a feed view, summary table, calendar view, and optional ranking. In addition to making it simple for employees to post a daily report, each report can be discussed, emailed, searched, and used like any other TeamPage article. For example, a visit to a customer which includes a suggestion or identifies a problem can be tagged with a follow-up task pinned to the original report and person who reported it, easily tracked from start to finish. Like other TeamPage plug-in extensions Takashi's Daily Report is packaged as a single file that can be uploaded and installed with one click. Plug-in extensions add or override TeamPage capabilities, add new tabs, views and new setup pages to configure the appearance and behavior of the plug-in. TeamPage extensions include localized resources so the same plug-in can support many different languages - Japanese and English in this example. See Takashi's Daily Report Form post for screenshots and examples. For a free TeamPage Forum and support account click here. Jul 2016 | TeamPage Real Time Daily Report 日報 (Japan): Traction Software Japanese Business Office releases dedicated Daily Report 日報 solution. See DailyReports.biz for a live demonstration, pricing, feature summary and frequently asked questions. 日報プラグインをリリース: Takashi's TractionSoftware.jp post on his Daily Report plug-in. View Google English translation. Eat your spinach: Email is good for you, but it could taste a lot better: Takashi explains the Japanese business practice ホウレンソウ (HORENSO) "... a way of information sharing by way of aligning members' understandings and synchronizing actions about changing circumstances that happen in and out of an organization." Quality Management: Document your processes; track risk and improvement actions; watch what's going on throughout your organization, and make your auditors smile. The TeamPage App connects to a TeamPage server and makes it easy to stay up-to-date with the latest activity in your TeamPage server. You can download the free TeamPage App from Apple's iOS App Store. You can quickly scroll through and review your notifications and recent discussions in a clear and easy-to-read format optimized for mobile devices. Articles that you read in the app are marked read in your notifications list, making it easy to manage notifications when switching between devices. Using the context menu, you can add any article to your worklist or reply via email from within the app. You can read, reply to, and add to your worklist even when you're offline; when you reconnect, your changes are synced back to your TeamPage server. The TeamPage iOS App provides TeamPage lets you to interact with your own TeamPage server. • This view lists all the activity that you are allowed to see on your server. • The most recently commented on discussions appear first in the list. • The author, time, ID, and a snippet of the first unread comment are displayed in the list. • When you open a discussion, the view scrolls to the first entry in the discussion that you haven't yet read. • Any articles to which you are subscribed or for which you receive TeamPage notifications appear in the notifications list. • Notifications you read or delete in the mobile app are marked read or deleted in TeamPage as well. • There a toggle switch provided that switches from the discussion thread to the full live TeamPage web interface, allowing customers familiar with TeamPage access to the web interface, which is what they currently use on iOS devices. The toggle switch remembers its last setting, so if you prefer the live interface, you can stay in that interface as you switch between threads. • Context menu lets you add an entry to your worklist or reply via email (incoming email support must be configured in your TeamPage server for this to work). • Swipe left and right to visit the next or previous discussion. TeamPage is a powerful, hypertext-based collaboration platform used worldwide by customers in Consulting, Manufacturing, Education, and Government for Product Management, Business Process Management, Compliance Management, Knowledge Management and Collaboration. TeamPage Winter 2015 Release introduces a new TeamPage Quality Management option. The Quality Management module adds Feedback, Non-Conformance, and Corrective Action forms and dashboards to TeamPage's standard support for authoring, delivery, and tracking of quality and compliance documentation. The new Quality forms and dashboards make it simple to manage the full life cycle for manufacturing, operations, and other procedures based on ISO 9001 or other compliance standards. Signature Requirements is a new capability which lets you require people to sign TeamPage articles either once or on a recurring basis. Signature Requirements can be used to collect approvals for publication, confirm that a document has been reviewed or a process followed, or for any other situation where a set of users and groups must explicitly acknowledge that they have reviewed an article. Signature Requirements is included with the Quality Management option, and is also available as separately priced independent option, please contact us for details. The Quality Management module adds a Quality tab with Overview, Feedback Reports, Non-Conformances, CAPAs (Corrective and Preventive Actions), and Quality Calendar subtabs to any TeamPage Space. This makes it simple to set up separate Quality processes for different departments or use cases on the same TeamPage server - or just use a single Space shared by all of your teams. The Quality Management module also adds new Feedback Report, Non-Conformance, and CAPA forms to TeamPage. These Quality forms work like specialized TeamPage tasks, with additional pull down and fill in the blank options used to classify, assign and track Quality related actions. Action tracking, calendar notification, history, search, personal worklist, email digest, and other capabilities work just like they do with standard TeamPage tasks. This enables you to not only track the status of Feedback, Non-Conformance, and CAPA items, but also to use TeamPage collaborative and action tracking capabilities to work with your team to diagnose the problem, come up with a solution, then implement and test the updated procedures - while keeping everyone on the same page. TeamPage streamlines and simplifies the compliance process for everyone. By combining TeamPage authoring, delivery and tracking with Quality Management module reporting, you get a system that's easy for people to use to get their work done as well as a system that makes your Quality Management team - and auditors - very happy. Feedback Reports, Non-Conformances, CAPA subtabs each include a dashboard view with burn up chart, pie chart summaries, and an interactive tracking table for the corresponding Feedback, Non-Conformance and CAPA forms. The sidebar shows the total number of tasks and sum of tasks times for all forms of that type, with a choice to show only open Tasks to include completed items. Click any segment of a pie chart to zoom in on items that match that filter. The interactive Tracking table for each subtab lists the title and selected properties for items of that type. You can choose any of the form's properties to show as table columns, and sort by any column by clicking the column name. The items shown in the table drive the burn-up chart and pie charts for the corresponding dashboard view. Click the Add or Update buttons to create or edit the corresponding form type. The CAPA form shown above includes pull down selectors for Initiator type, Issue Type, Location, Review Phase and more, along with auto-lookup fields to fill in the responsible person - or persons - and action dates. Every organization will want to use its own values for pull down choices like Initiator type, Location and other fields. The Quality Management setup form lets customers who have appropriate permissions fill in their own choices for pull down options as well as selecting template articles that contain the default content for each type of form. The Quality Management module is an extra cost option that is now shipping. The Signature Requirements module is included with the Quality Management option, please contact us to learn more. TeamPage now has a separate module that supports managing signature requirements. You can require selected users and groups to read, approve, authorize, or certify that they have taken some action associated with or described in a TeamPage article. You can schedule signature requirements to be completed by a specific date, and you can also set them to recur automatically, for example to help clinical staff fulfill the requirement to review certain Standard Operating Procedures on an annual basis. The types of requirement supported are extensible, so you can easily add custom types. The system reminds everyone involved of upcoming and overdue digital signature requirements, and managers can see exactly who signed when—and who has not yet signed—broken down by person, group, document, or space. For auditability, signatures track the exact version of the document signed, and if a document has changed since the last time you signed it, the system shows you the exact changes between the versions. Signature Requirements is now shipping as part of the Quality Management option or as a standalone option, please contact us to learn more. Type-ahead completion for unified search now supports "in-order" character-by-character matching for space and user names to make it easier to find thing even if you're not sure how to spell what you want. Tag names now offer type-ahead completion. User name and user display name type-ahead completion is now provided even for users who don't have full address book search permission. The algorithm used to show type-ahead suggestions ordered by search hit score has been improved. When requirements are in effect for passwords for user accounts managed in TeamPage (e.g., minimum length or minimum number of special characters), a summary of the requirements will be displayed anywhere a user password can be set for either new or existing user accounts. Traction: With a fairly loyal customer base, Traction continues to punch above its weight. The company is finding interesting use cases for the TeamPage software particularly in the ISO / quality management space for manufacturing customers. See Kashyap's blog post for other sneak peaks. Contact Real Story Group for a complementary vendor evaluation chapter and the full Enterprise Collaboration and Social Software Report. Contact Traction Software to learn about new TeamPage capabilities and product solution packages for Quality Management, Compliance, and Continuous Improvement. Takashi Okutsu, Director of Traction Software's Japanese Business Office has been on a roll. His new plug-ins include: a new Bootstrap3 skin; a new JQuery Mobile skin; Customer Support Request and Customer Quick Reference plug-ins. Takashi is also the author of Gantt Chart, Traction Poll, Mind Map, Pop-up Annotation, and other plug-ins, free to Japanese and International Traction customers. Japanese customers, please see the プラグイン拡張機能 (Traction Plug-in Extensions) page of the Traction Software's Japanese site. English speaking customers, see this Google Translation of the Japanese Extensions page. Non-Japanese speaking customers can download and use localized English versions of plug-ins from the Traction Customer Forum (free registration required). Follow TSIJPBO and TractionTeam on Twitter! TeamPage Fall 2015 Release introduces Personal Worklists: Track and share what you plan to work on. It's easy to add, rearrange, organize, checkoff and share items on your personal worklist. New Quick Forms make common actions simpler using a right click action or keystroke. TeamPage now automatically checks for updates and notifies your administrator. Worklists make it easy for you to track and share what you plan to work on. To add an article to your worklist, use the right-click Add to Worklist action. You can also press w in a task list or feed view to add the selected article to your worklist. As you complete items on your worklist, you can check them off or use the Remove from Worklist action to clear them. If you want only certain people (or nobody) to be able to modify anyone else's worklist, you can add them to a designated Worklist Managers Group in Server Setup. TeamPage now offers several quick forms for common activities such as closing a task, assigning a task, editing an article, and deleting an article. These quick forms can be launched using the right-click context menu, or with a keystroke in list views when you have an item selected (see keystroke table below). Task lists and worklists now support separators, which can be used to organize the list using outline-level headings. Each heading also shows the count and the total time estimates for the tasks contained in that section. • Ordered lists now have their own print view, including separators. • Task lists can now be reset to the default order, clearing any manual overrides. The order of the Tasks tab has been rearranged to put Projects first, followed by Milestones, and then Tasks, in order guide people towards using Projects, which support ordered tasklists. Projects can also be ordered and color-coded on the Projects tab, and the Projects tab can be filtered by color as well as other attributes. On the project tab, each project block also shows the project's most recent status update. Expanding projects on the projects tab shows an abbreviated project dashboard, highlighting the project's milestones and top tasks. Many views now provide helpful feedback when no content is displayed. TeamPage now checks periodically for whether a newer version has been released and, if so, displays a message to server administrators. Administrators may choose to skip a version or temporarily dismiss the update notification, but can check again any time using the "Check for a New Version of TeamPage" button that appears on the server settings > general page under Runtime Info. Takashi Okutsu of Traction Software's Japanese Business Office wrote a blog post, Teampage hypertext journal: Design concepts. Starting from Chris Nuzum's Tripping Up Memory Lane presentation, Takashi explains how TeamPage's append-only journal models editable content, links, and relationships − while maintaining a full audit trail. See this Google English translation. I felt it important in many dynamic operations to keep a log (sometimes termed a "journal") that chronicles events by means of a series of unchangeable entries (for instance, to log significant events while evolving a Plan, shaping up a project, trouble-shooting a large operation. or monitoring on-going operations). These entries would be preserved in original form, serving as the grist for later integration into more organized treatments. I also wanted something that would serve essentially the same recorded-dialogue purpose as I perceived a professional journal (plus library) to do. Compcon 75 Digest, Sep 1975 pp 173-178, Douglas C. Engelbart THE NLS JOURNAL SYSTEM see the full paper, courtesy of the Doug Engelbart Institute. Working from Chris's presentation notes (pdf), Takashi explains how to Teampage builds on Engelbart's model to support editable, stable two-way links, relationships, and content. Takashi uses an animation cel analogy to illustrate how the effect of multiple entries in a TeamPage journal can be superimposed to show the effect edits at any point in time. For more detail, see Teampage's US Patent 7,593,954.